Though I'm more interested in colour schemes, instead of any one single colour, I do love reds. You don't need a lot, just a nice pop of red is so eye catching. Especially pared with a cool colour scheme. 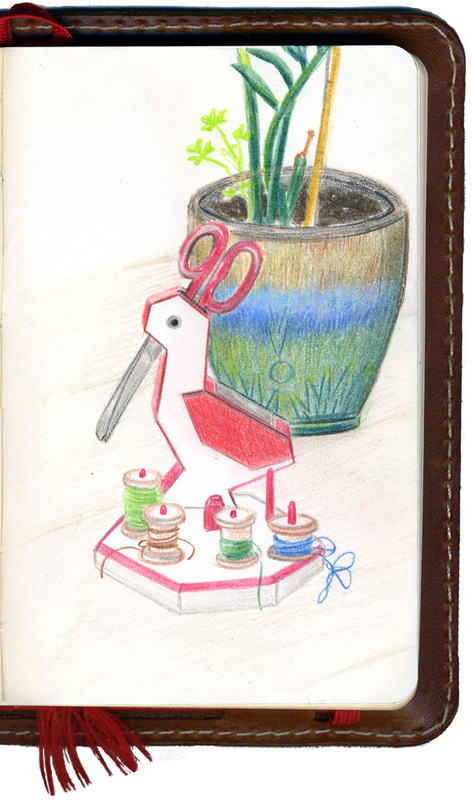 So my pencil crayon sketch is of one of my favorite possessions, a scissor and thread spool holder in the shape of a seagull (love!). I picked it up maybe 4 or 5 years ago at a thrift shop in Halifax. That is an awesome seagull! I love red too! Okay, really, I love all the colours. Lovely contraption! And I love that you scan the whole sketchbook.